Bed & Breakfast is situated in the picturesque Axe Valley, an area of outstanding natural beauty near the Devon and Dorset border, under 3 miles from the Jurassic Coast, a World Heritage Site. Colyton, a small town with a village atmosphere, provides local pubs, restaurant, general stores, butchers, pharmacy and post office all within five minutes stroll. Set in beautiful unspoilt countryside, riverside and coastal walks prove very popular with our guests, whilst keen golfers can enjoy Axe Cliff golf course only 3 miles away, the views from the course along coastline can only be described as stunning! Lyme Regis, Sidmouth and Honiton, all a short drive from us offer yet more golfing challenges. The picturesque fishing village of Beer and the charming village of Branscombe are nearby and well worth a visit if time permits. Colyton is close to Devon and Dorset's Jurassic Coastline. The Seaton Marshes Nature Reserve offer a divers selection of bird life throughout the year. The Seaton Tramway that travels to Colyford and Colyton between April and October a great family day out that child of all ages will love. Seaton's Electric Tramway's follows a three-mile route runs through the scenic Axe Valley,from Seaton, past Seaton Marshes Nature Reserve to the village of Colyford and the ancient town of Colyton. The journey takes half an hour from end to end. In Seaton, the impressive Tramway Terminus is close to both the town centre and the beach. 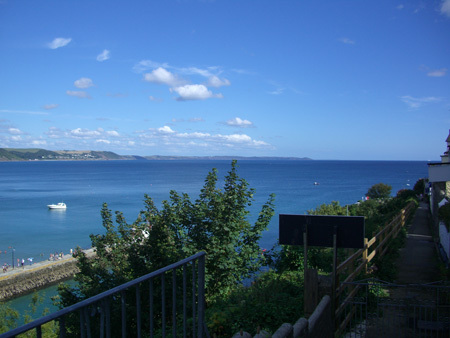 Devon Online Offer a variety of self catering accommodation ( Caravans, Holiday Cottages, Campsites and Holiday Apartments) close to Devon's Jurassic Coastline . In this region of Devon, Holiday cottages and barn conversions are very popular choices for holiday stays, offering a subtle blend of period charm and original features with modern comforts. Family's with children and active youngsters often choose to stay at one of our listed holiday parks or Caravan sites, as they often have a range of activities, swimming pools, play areas etc. included on site. For more than 40 years Oakdown Holiday Caravan Park in Devon has been carefully fashioned by the Franks Family, from the open Devonshire meadowland to its current multi award winning standard. No straight lines here, just gentle curves, spacious groves, seclusion, privacy and peace and quiet. Situated close to Sidmouth, we are the area’s only AA 5 Pennant Park. At the end of last year we won GOLD in the Visit Devon Tourism Awards 2017 and in February this year we won GOLD in the South West Holiday Park of the Year 2018 and if that wasn't enough, we won GOLD in the David Bellamy Conservation Award. Our Devon holiday park combines a stunning location and great accommodation range with top class facilities and an immaculate site.